What is the deal with Joshua trees and yucca moths? One of the strangest things of all about Joshua trees may be the way that they are pollinated. Many plants attract pollinators with rewards, like sugary nectar, or excess pollen that animal pollinators can eat. A wide variety of insects, birds, and even mammals visit flowers in pursuit of such rewards, incidentally carrying pollen from flower to flower in the process. Joshua trees, like all yuccas, rely on a different strategy for pollination. Joshua trees produce no nectar and comparatively little pollen. And, instead of attracting a variety of different pollinators, yuccas rely exclusively on a few species of drab moths to assist them with reproduction. These insects, known as yucca moths, are grey, white, or sometimes black, are between one-quarter inch to an inch in size, and at first glance seem entirely unremarkable. However, they have one feature that no other species of moths possess. Surrounding the female yucca moth’s moth is a pair of ‘tentacles’ – long, flexible, coiled appendages. The moths use these tentacle to collect balls of pollen from yucca flowers. The moths then fly to another flower, where they use their tentacles to deposit the pollen onto the floral stigma – the receptive surface where the pollen needs to land in order to fertilize the flower. Different species of yucca moth use different strategies to get the pollen into the right place. Some moths use a bobbing, pecking behavior, like a child’s drinking bird toy, pushing their tentacles into the stigma to pack the pollen into place. Other species unfurl their tentacle while holding a small batch of pollen and then use their legs and feet to stuff the pollen into the stigma. You can see this in the video below, which shows a female yucca moth inside a cut-open flower, pushing pollen toward the stigma. Watching the moths’ behavior, it’s hard not to come to the conclusion that the moths are pollinating the plants intentionally. Although it is reasonable to wonder whether moths – not known for their smarts – do anything intentionally, it sure looks like they are trying to pollinate the flowers. Why would a moth go to so much effort just to pollinate a yucca? The answer is that the moths are getting something out of the deal. Shortly before they pollinate a flower, the female moths use a needle-like organ called an ‘ovipositor’ to inject their eggs into the developing flower. As the flower matures, it will develop into a fruit and produce seeds. Inside the fruit, the moth’s eggs will hatch into caterpillars that will eat some (but usually not all) of the developing seeds. So, by pollinating the flower, the moth ensures that there will be a nutritious food source for her offspring. And because yucca moths are very reliable pollinators, the trees don’t need to offer ‘bribes’ in the form of nectar, and can get away with producing very little pollen since almost none of it will be wasted. Things aren’t as simple as they seem. Although on the surface the relationship between the Joshua tree and yucca moths seems to be very harmonious, a closer look suggests that that it is an uneasy alliance. On multiple occasions yucca moths have developed strategies to ‘cheat’ the system – moths that wait until the yucca has been pollinated by a different species of moth, and then come lay their eggs afterwards without having to do the hard work of pollination themselves. Likewise, there is some evidence that the plants will abort flowers that have too many yucca moth caterpillars (this kills both the caterpillars and the developing seeds, but spares the plant the cost of developing a fruit that will produce few or no viable seeds). Finally, there is some evidence that some species of yucca have evolved changes in the shape of the flower to prevent the moths from laying eggs on the developing seeds. So what about Joshua trees in particular? The story of yucca moth pollination in Joshua trees has gotten even more interesting recently. A careful study of the moths that pollinate the Joshua tree revealed that the trees are actually pollinated by two similar, but distinct species. One of the two moths is bigger, and is lighter grey in color. The bigger moth also has a longer ovipositor. Most interestingly of all, the biggest difference between the trees pollinated by each species of moth is in their flowers, and the biggest difference in flowers is the part of the flower where the moths lay their eggs – the style. Trees pollinated by the larger moth have a longer style, and trees pollinated by the smaller moth have a shorter style. What’s more, if moths accidentally visit the wrong type of tree (which they do sometimes in places where the two trees grow together), the moths are less successful in laying eggs. All of this leads us to think that the two types of Joshua tree have adapted to the different species of moths. Evolutionary changes in the flowers may have occurred as a way to reduce the number of seeds that get eaten by the moths’ caterpillars. The moths, in turn, may have evolved differences in body size as a way to compensate for the changes in the flowers. This process – changes in one of the organisms causing changes in the other, and vice-versa– is known as ‘coevolution’. 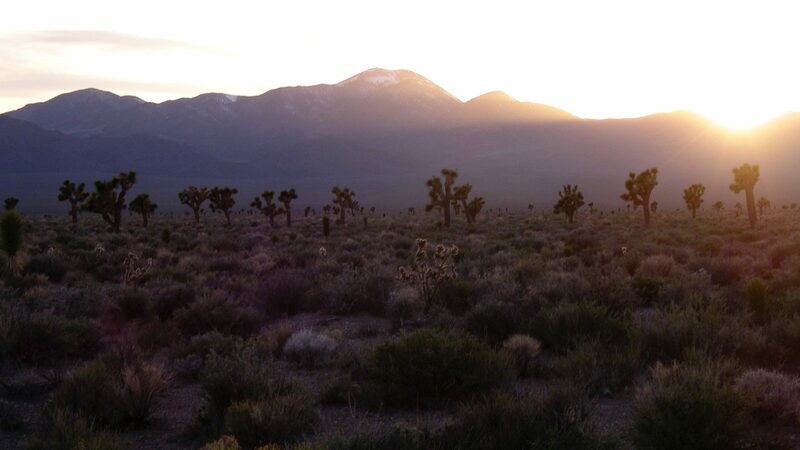 Understanding how the genetics of the Joshua tree might have enabled coevolution is one of the questions we hope to answer with a genome sequence.